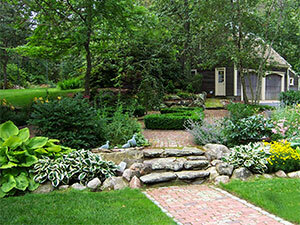 At Briggs Landscape Construction, we are experts in the field of paver installation. 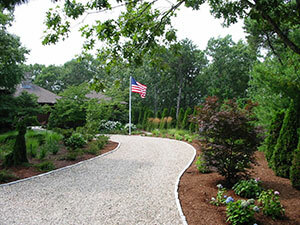 Whether you are looking for a new paver patio, paver driveway, or paver walkway, you can trust us with your project. Along with keeping your budget in mind, we can handle any custom design, shape, or pattern you choose. Our focus is to guide you through the design process and provide worry free installation. Along with pavers, we can also install many other hardscape products, such as limestone, slate, flagstone, and more, and construct the custom patio or walkway of your dreams. 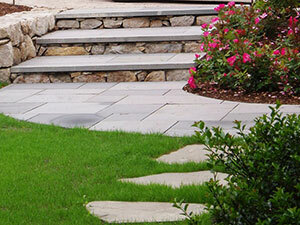 Due to the fact that concrete is poured in large slabs it is much less durable and more prone to cracking than pavers. The earth beneath, over time, settles and goes through freezing and thawing periods. This causes the earth to move beneath the concrete, making its support base unstable. These same freezing and thawing periods also take affect on the integrity of the concrete itself as well. The reason pavers do not crack nearly as much as their concrete slab counterparts, is that each paver is its own miniature slab. To help you understand this try to crack an ear of corn in half. Now try to crack one of the halves in half again. You will notice the smaller it becomes the harder it is to crack. Conversely, the larger the surface area is, without a joint, the more prone it is to cracking. Pavers have the ability to “give” beneath the heavy weight of a car, for example, due to their relatively small individual size as alternatively compared to a large slab of concrete. This theory can apply to your driveway, patio, or even your walkway. Pavers also offer much more than durability. 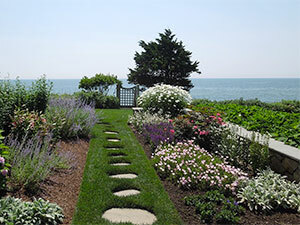 Look at how much more eye appealing it is to look at a paver patio, driveway, or walkway, as opposed to a poured concrete or asphalt driveway, patio, or walkway. It not only enhances the whole look of your home but it will add to your home’s equity. In fact, you will typically gain more in equity than you spend on the project. Just think, you can give your home a new life and fall in love with it all over again!